It was around a year ago that we were lucky enough to have Mabel come to stay with us. A lady came by and asked if we, by any chance would take her on, as she was very small for her breed and had been given several reprieves from the butchers. She is a Ryland, or maybe a Southdown, but either way she’s half the size she should be. After discussing things and visiting her, I completed the necessary paperwork and brought her home. Well, as I say that was almost a year ago and how things have moved on. Back in October we started to consider, which of our ewes were going to be lambing this spring and obviously Mabel came up in conversation. Our biggest concern was that she was so small and we didn’t want her getting into any trouble during the pregnancy or during the delivery, because of her size. After much discussion, we decided that we would try her with the rest of the ewes and keep a very close eye on her. On November 4th last year, I brought Mac our new tup down from the top field daubed him up with raddle and let him loose on all these women. It’s funny how things turn out, as he quickly started sniffing around several of the ewes, with his tongue going ten to the dozen, but then spotted our Mabel across the field, who was just watching on from afar. Well, that was it, he forgot about the rest of the ewes for the day and commenced with romancing her. We walked away and left them in peace, awaiting spring to arrive and although we were concerned whether we had done the right thing with Mabel, with fingers crossed, we were obviously keen to see how things would turn out. Throughout the last week, Mabel was regularly up and down and with the weather getting ever so slightly warmer, that didn’t help her as she is extra woolly at the moment, in the months leading up to shearing. By the end of the week, I had started on my cycle of checks through the day and night, ensuring that the ewes were all in good shape as we awaited the commencement of lambing 2017. Friday morning arrived, which was a day ahead of Mabel’s due date and all had been well through the night and so back to my bed I went for a little more kip, before jumping up again as my next alarm went off at 6am. I hurriedly got myself up and out and although I was greeted with a picture of serenety and calm across the sheep field, in the far corner was our Mabel who was still up and down like a yoyo. I waded through the rest of the sheep, who looked at me funny, wondering where on earth was breakfast, but I had other things on my mind! As I got closer to her, I could see that her waters had just gone and she was now in full delivery. Within a few minutes she was laid down on the grass and pushing hard whilst the pain of each contraction was clearly reflected across her face. 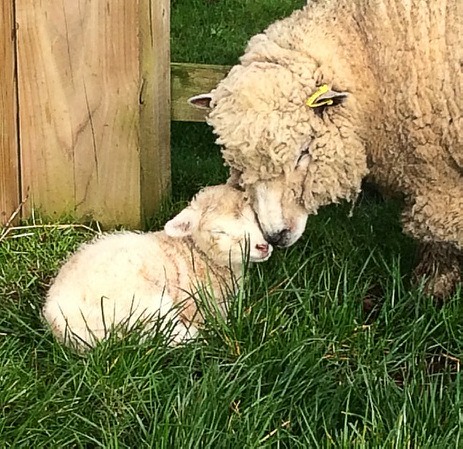 What seemed like only moments later, Mabel gave birth to her firstborn, a gimmer lamb, our first lamb of the year. She did so well and sailed through the delivery and is doing a fantastic job as a mother, with the cutest little lamb you could ever wish to see, thankfully, confirming that we definitely made the right decision last November.